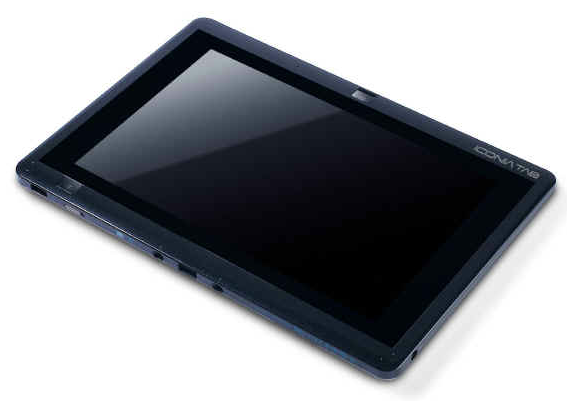 Acer recently gave a sneak preview of its latest Tablet computer called the Iconia Tab W500. The company says the W500 features a hybrid design that offers the best of both worlds - a HD multi-touch Tablet computer and productivity of a standard notebook via a keyboard. 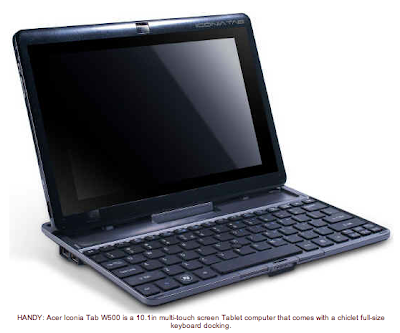 The 10.1in multi-touch screen Tablet computer comes with a keyboard dock, making it easier to enter text. At the side of the keyboard, you will find an Ethernet port for faster Internet connection and USB ports for external devices. This thin and lightweight Tablet computer measures 210 x 280mm and weighs about 1kg. The W500, which runs Windows 7, comes with a dual-core AMD C-50 processor, AMD Radeon HD6250 graphics card and a screen resolution of 1,280 by 800-pixels. Other notable features include a HDMI port with HDCP support, 2GB DDR3 memory, 32GB solid-state drive, 1.3-megapixel webcam (back and front) and 802.11b/g/n WiFi connectivity. The W500 is pre-loaded with Acer clear.fi (multimedia sharing software), Acer Video Conference Manager (videoconferencing software) and the Acer Ring interface for launching touch applications and utilities. It also comes with an integrated 3,260mAh lithium-polymer battery that can deliver up to four hours of HD video playback.